Fear not. We’re here for you. Just like last year, we’ve compiled 50 apps that are essential for Android users. These range from media apps, to tools, to simple housekeeping fare. 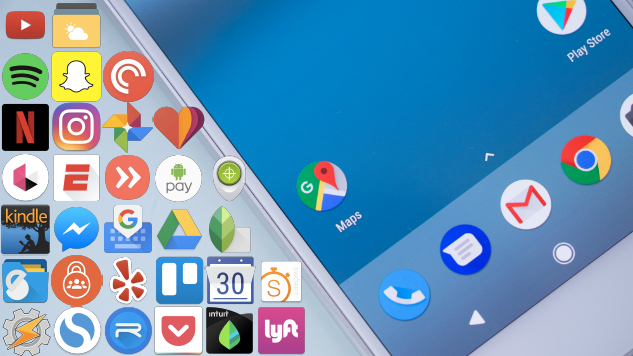 No matter what section of the Play Store they came from, they all hold at least one thing in common: they deserve a spot in your app drawer. Unlike iOS, Android has a few options for mobile payments depending on what device you have. If you’re locked into Samsung’s Galaxy line, using that company’s own payment app is the likely choice. For anyone else, the answer is Android Pay which allows users to add any card from a participating bank (which is most major U.S. banks) and a large number of rewards cards. Keeping yourself on task can be immensely difficult. Any.do is a great way to do so thanks to its ability to sync between all of your devices, including desktop, so you’re always in the know about what’s next on your to-do list. Add in a deep bench of features, like sharing lists and tasks with friends and co-workers, and Any.do becomes a must have. Of the two major mobile operating systems, Android is the more vulnerable from a security perspective. Though the best security is still common sense, it’s nice to have a safety net. Avast is one of the most recommended security apps in the Play Store, and for good reason. It has a host of features, including WiFi scanning, app locker, RAM boost and more. Blendle is one of the most interesting new apps to hit the Play Store in recent years. It shakes up the mode of delivery for high quality, subscription-based journalism, allowing users to buy articles à la carte from top-tier publications like The Washington Post, The New York Times and more. If you ever need to scan documents on the go, CamScanner should be your go to. It’s incredibly simple to use and helpful in a pinch. The app also allows you to sync your scanned documents across multiple devices, so you can keep everything up to date. Duolingo has long been one of the best language apps on the market, and nothing has changed in 2017. It’s beautifully designed, easy to use and offers real instruction. The app claims that 34 hours of use is equal to a semester of university-level education. Though the worldwide leader in sports has fallen on hard times recently, it’s app is still one of the best designed and easy to use options for sports fans. Timely, customizable updates for your favorite sports and teams, plus industry news, make it a must have. Flipboard shook up its approach recently, but the core of the app remains the same. It collects various news sources and topics into “magazines,” giving users a single place to quickly catch up on the news they care about. It remains one of the best looking, and useful, news apps on the market and one that is well worth your time. There is no shortage of keyboard apps in the Play Store, but Google’s own offering is the one you should have on your phone. After debuting on iOS, Mountain View finally brought the full GBoard experience to its own operating system months later. Though it seems a simple addition, having a Google search button directly on your keyboard is incredibly useful, making the whole experience of using your smartphone more efficient. Arguments can be made for numerous Android web browsers, including Dolphin and Opera Mini, but Chrome gets our nod because of the simple fact that you’re probably using it on your desktop or laptop. The app’s ability to sync your searches and history across devices is useful in a way that isn’t always apparent, but the moment you want to visit a website, whose address you can’t remember, on your laptop, you’ll be elated you were using Chrome on your phone, too. There are no better online office apps than Google Drive. Seamlessly working between all your devices, it’s the best and easiest way to handle documents across multiple locations and machines. The only downside is that, in order to get the best experience out of Drive, you will have to download a few other apps, like Google Sheets. Fit’s best feature, aside from being a beautiful and effective app in its own right, is its willingness to play well with others. If you need a more robust experience than what Fit offers with its basic fitness tracking, simply team it up with another fitness app you love. Waze has carved out its own section of the market, becoming a clear competitor to Google Maps (though, not really, as Google owns both), but the latter is still king. It’s the best maps app on the Play Store, and is always improving with new, and better, features like the recent addition allowing users to add a stop along their road trip. Quietly one of Google’s best apps, and perhaps the best product it’s released in years, Google Photos is absolutely a must have. It’s the best way to index all of your photos, particularly because it will do it automatically for you. The real star of the show, though, is the machine learning at work that makes searching through your photo collection a breeze. Sometimes lambasted for its direct, and often humorous, translations, the Google Translate app is actually quite helpful, especially if you’re a frequent traveller. It uses the smartphone platform intelligently, letting users scan signs, posters and other items in the real world and translate them on their phone. If you find yourself in unfamiliar territory, look to Google Translate to lend a helping hand. If you live in one of the thousand-plus supported cities, you need to have GrubHub on your phone. It turns tons of restaurants into instant takeout options because it will deliver the food for you. All you have to do is get it on your phone, search for what you’re craving and place the order. With the world becoming more stressful each and every day, an app that helps you manage that stress is indispensable. Headspace is one of the best apps available for adding a little mindfulness to your day, with its guided meditation sessions that help you relieve stress and find an emotional balance. A classic Android app, IFTTT helps you unlock your phone’s potential. Its wide array of applets let users connect multiple applications together, so your Philips Hue lights will blink when your favorite baseball team scores, or your steps from Fitbit will be logged into a spreadsheet on Google Sheets everyday and much, much more. Support for Google Home and Amazon Alexa make it even more useful. The race to find the perfect email app may have cooled of late, but there are still numerous great options to choose from on Android. Inbox gets our vote thanks to its streamlined interface, and built-in smarts. It will bundle similar messages together, show any reminders you set throughout the day, let you snooze messages until you have time to deal with them and more. A no-brainer. Instagram is a juggernaut, and it needs to be on your phone. Sure, it may be blatantly ripping off the core features of Snapchat, but its still a hotbed for the social media movers and shakers of the world, and a phone without it is one sorely out of the zeitgeist. One of the primary steps everyone should take toward being more secure online is creating varied, intricate passwords. A manager like LastPass makes the process easy. It lets users sync across multiple devices for free, and will even read the context of your screen to know if it should chime in with a username or password suggestion. LastPass can give you ease of mine, and ease of use.